Near the beginning of their crime spree, gun-waving toughs held up this market, in the Centennial neighborhood. A group of young armed ruffians apparently found it so easy to rob the Rounders Bar in Gresham on December 9 that they decided to continue their criminal enterprise about a month later, but focusing on neighborhood markets. 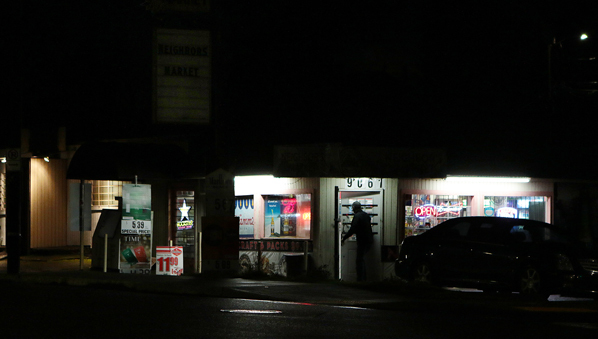 On January 2 between 7:30 and 9:00 p.m., the robbery crew held up three family-owned convenience stores – starting in the city of Milwaukie, and then moving into East Portland less than 30 minutes later, robbing “Smokers Zone” at 15400 SE Powell Boulevard, and – as reported in East Portland News – then “Roll Your Own Market” at 15801 SE Division Street. Officers are on the lookout for armed robbers who are distinctively dressed. 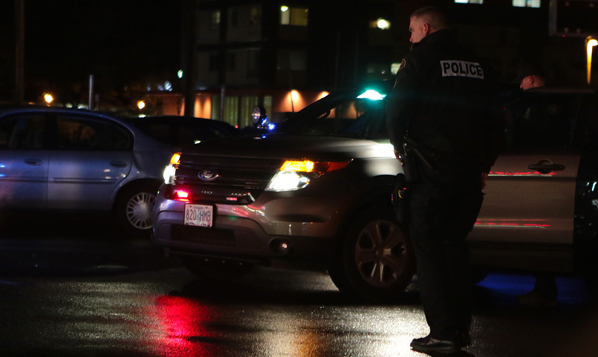 Based on descriptions from the clerks, and surveillance images, detectives with the Portland Police Bureau (PPB) Robbery Division believed these holdups were committed by the same group of youths, who were usually dressed identically. “Investigators dubbed the group the ‘Tracksuit Bandits’, because they wore matching track suits during several of the armed robberies they are suspected of perpetrating,” reported PPB Public Information Officer Sgt. Chris Burley when announcing the arrests. 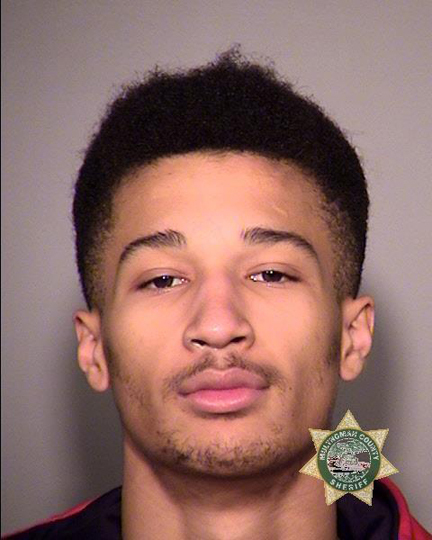 The first of the suspects to be arrested was 18-year-old Antonio Trayvontae Montgomery – nabbed during a January 12 traffic stop near SE 102nd Avenue and Pine Street, where officers found him possessing two firearms. 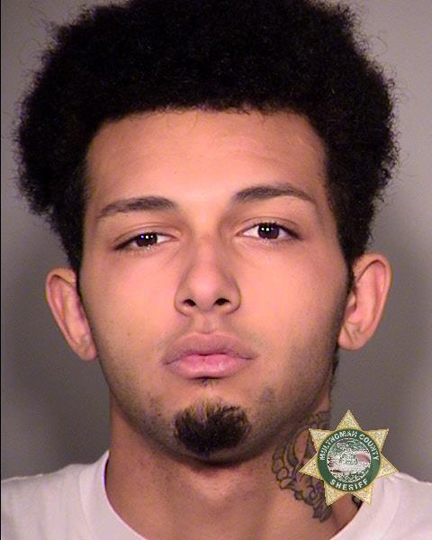 Montgomery was booked into the Multnomah County Detention Center (MCDC) at 4:14 a.m. on the day of his arrest, on two counts each of Unlawful Possession of a Firearm, Possession of a Loaded Firearm in the City of Portland, and “Carry Concealed”. At his arraignment the following day, a Multnomah County Court judge dropped the “Carry Concealed” charge, but Montgomery was ordered to face the other charges, and assigned a combined bail of $10,000. However, he remains held in Inverness Jail, without bail, pending additional charges. On January 16, Robbery detectives believe the same group of robbers held up this store in the Centennial Neighborhood. 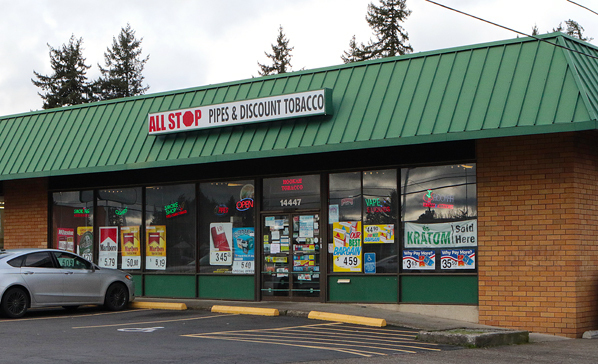 Based on their descriptions, police believe the same crew then committed an armed robbery at “All Stop Pipe and Tobacco” at 14407 SE Division Street at 7:09 p.m., taking an undisclosed amount of cash from the frightened employee. Fearing these armed robbers, described as “young, quite tall black males”, would continue until they were captured, detectives doubled-down on the investigation. Not only was the Parkrose “Neighborhood Market” store also robbed, one of the suspects shot at the clerk during the robbery. Then, at 7:04 p.m. on January 21, the robbers held up the “Food King” store at 2909 NE Prescott Street. 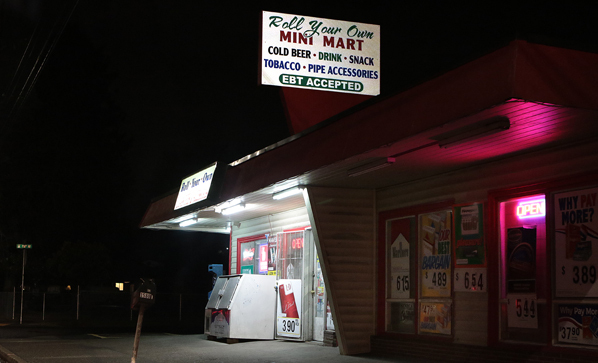 An hour later that evening, at 8:14 p.m., officers were sent to another robbery call a few blocks away, at the “Neighborhood Market” convenience store, at 9061 NE Sandy Boulevard. The employee said that two suspects entered the business and demanded money, while one of the suspects brandished a firearm. 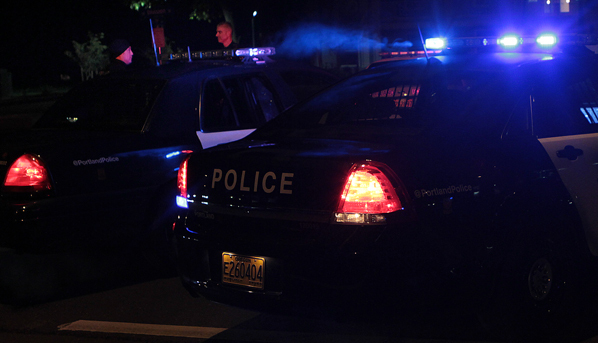 It doesn’t take long for officers to find a vehicle, in which they suspect the armed robbers are riding. “After obtaining an undisclosed amount of cash, while leaving the location, a suspect fired a handgun at the victim, but the clerk was not struck by the gunfire,” Burley said. 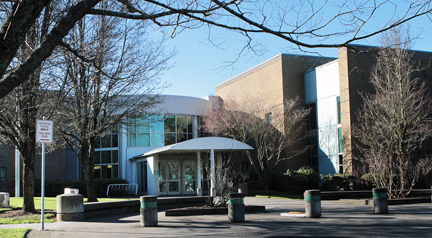 Investigators knew that Montgomery was in custody; but, based on information learned during robbery investigations in Portland, Milwaukie, and Gresham, detectives from all three jurisdictions believed there were other suspects at large. Officers responding to the back-to-back robberies stopped a Ford Excursion in the area, and after observing “additional information during that the stop that suggested they were involved in the robberies, Lamarr J. Luster Jr., Kobe B. Cordray and Angelo D. Luster were directed out of the Ford Excursion and placed into custody,” Burley said. 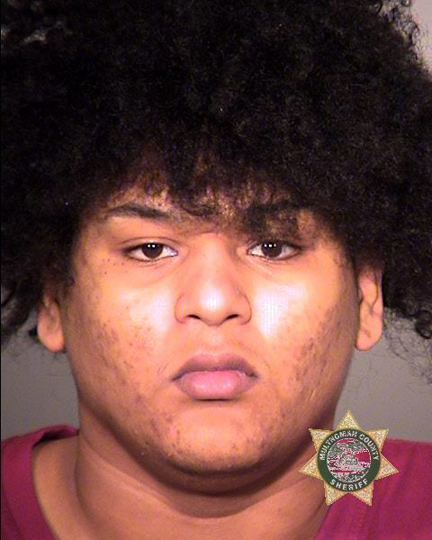 19-year-old Lamarr Juan Luster, Jr., is arrested, suspected of being part of the group responsible for multiple armed robberies in the Portland metropolitan area. 19-year-old Lamarr Juan Luster, Jr, was booked into MCDC at 4:16 a.m. on January 22 on two counts of Robbery in the First Degree and two counts of Robbery in the Second Degree. After his arraignment later that day, Lamarr Luster, Jr., learned that his combined bail was set at $1 million; he’s currently still in custody at MCDC, held in lieu of bail. Also arrested, and charged with armed robbery, is 20-year-old Kobe Branden Cordray. 20-year-old Kobe Branden Cordray was also booked into MCDC, at 4:21 a.m. on January 22 on two counts of Robbery in the First Degree and two counts of Robbery in the Second Degree. At Cordray’s arraignment, he was ordered to stand trial and his combined bail was also set at $1 million. Now lodged here, at the Donald E. Long Juvenile Detention Center is 17-year-old Angelo Dewayne Luster. 17-year-old Angelo Dewayne Luster was lodged at the Donald E. Long Juvenile Detention Center on charges of Robbery in the First Degree and Robbery in the Second Degree. Anyone with information about these robberies or the “Tracksuit Bandits” is asked to contact Robbery Detail Detective William Winters at 503-823-0466 or William.Winters@portlandoregon.gov.